1) This article has been prepared for the 5th FIG Regional Conference - Promoting Land Administration and Good Governance to be held in Accra, Ghana, March 8-11, 2006. This paper was not presented in the conference. The governments of many African countries are currently investing in the improvement of their land administration – aiming mainly to develop an efficient land market. As a side product, there is the objective to decrease land conflicts through the implementation of a functioning land registration and/or cadastral system. Experience, however, shows that more is needed than surveying, demarcation and land registration to avoid severe land conflicts. The question therefore arises what are the deeper roots of land conflicts and how can we respond to them. Not only imperfect land markets, even a perfect land market cannot prevent land conflicts if it is not regulated by institutions. For the purpose of this paper two types of institutions are distinguished: constitutive and regulative institutions. 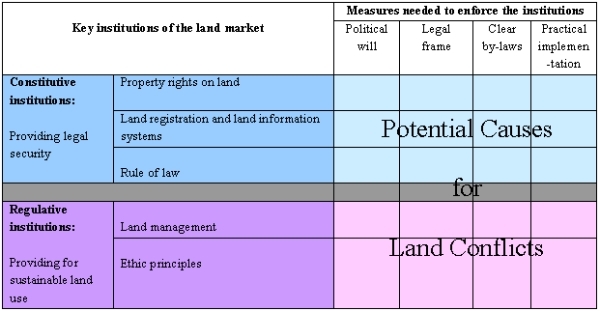 Constitutive institutions are needed to enable an economic efficient land market to work (such as land rights, land registration and rule of law), while regulative institutions are necessary to make the land market socially sustainable and environmentally sound (such as land management and ethic principles). However, even if all these institutions are in place, land conflicts can still occur. This is mainly due to extreme emotional and material needs. In most African countries, many constitutive and regulative institutions have massive functional deficits: Land rights are most often characterized by a fragmented or overlapping legislation and legal pluralism, resulting in unclear property rights and consequently land ownership conflicts. Land administration authorities dealing with land registration, land information systems, land use planning and land development lack trained staff, technical infrastructure, and financial resources. Beyond that, administrative services are over-centralised and responsibilities are often not clearly assigned or overlap each other, thus impeding cooperation and coordination. As a result, the little available and mostly incomplete or isolated data on land ownership and land use is being gathered by different non-cooperating institutions, making it difficult or even impossible to use it properly. Endless procedures and low levels of implementation are the result. Therefore, neither institutions constituting nor those regulating the land market make a substantial contribution to avoiding land conflicts. Given the low salaries and the openness to motivation payments of the people working within these institutions they rather contribute to land conflicts. Legal security is furthermore limited by insufficient implementation of rule-of-law principles, while mechanisms for sustainable land development suffer from the fact that ethical principles are not broadly acknowledged. For all institutions, lacking implementation is the crucial point. Unclear implementation guidelines and contradicting legislation worsen the situation. Political will is very unsteady. Generally, it can be concluded that imperfect constitutive institutions of land markets promote land ownership conflicts, while poor regulative institutions are responsible for land ownership as well as land use conflicts. It needs to be stressed that functional deficits are not the core reason for land conflicts; they merely facilitate them. Profit maximisation of a multitude of actors is the driving force, either by unjustly grabbing land or by excluding disadvantaged sections of the population from legally using land. Theoretically, these actors include all social gate keepers, mostly identical with principals in principal-agent-relationships. Notoriously low wages in the public sector contribute to corrupt behaviour of social gatekeepers in this field. In my opinion, however, the decisive factor for these irregularities is the “normality of misbehaviour”: Nepotism, corruption, and disregard for regulations are considered normal by the population. Social and religious values are of little relevance for everyday life; self interest is paramount to public interest. This underlines the importance of ethical values and rule-of-law principles in preventing land conflicts. If individual profit maximisation – under widespread absence of functioning institutions – is the underlying reason for land ownership conflicts, then a capitalistic land market associated with increasing land prices can be seen as facilitator. (For as long as land has no monetary value, land ownership conflicts occur comparably seldom.) In this situation, dysfunctional institutions constituting and regulating the land market act merely as catalysts of land conflicts – especially in times of institutional change. As any egoistic behaviour, taking advantage of functional deficits for the sake of reckless individual profit maximisation is based on emotional and material needs, which again are a consequence of psychical fears and desires. Therefore, psychical phenomena form the basis of land conflicts. A typical psychical fear is the fear of existence. This fear can result in extreme emotional and material needs such as the need for shelter, the longing for survival and self-esteem – in some cases resulting in a desire for power – and strong need for independence – often resulting in the accumulation of wealth. It is mainly the combination of very strong emotional and material needs (seeking power and wealth) that let people either break rules (institutions) or profit from institutional shortcomings. Land conflict resolution should therefore look at the psychical fears and desires of those breaking the law or profiting from loopholes – especially in those situations where illegal behaviour is rather the rule than the exception. This is the case in many post-conflict countries where psychical fears and desires and the thereby provoked emotional and material needs are a common phenomena influencing the entire society and overall development. Institutional changes are conflict prone and therefore tend to be phases of increased land conflicts. While some forms of land conflicts can occur under different and even stabile institutional frame conditions (such as border or inheritance conflicts), others depend on the kind of institutional change. Multiple sales due to legal pluralism for instance are typical for slow institutional changes that lead to the overlapping of two systems, while illegal sales of state land are quite common in situations of either abrupt institutional change that are marked by a temporary absence of rules (transformation) or longer term absence of a functioning legitimated institutional frame (civil war, dictatorship). Changing frame conditions often provide the base for land conflicts: natural disasters such as droughts and floods leading to rural-urban migration, natural population growth, the resulting increase in the demand of land and consequently land prices, the introduction of the market economy giving land a monetary value and thereby eradicating traditional ways of land allocation, increasing poverty making it difficult to acquire land legally and last but not least an institutional change causing a temporary institutional vacuum at the land market create fears, desires, needs, interests, attitudes and opportunities concerning land use and ownership that are no longer controlled and therefore easily lead to land conflicts (see Fig. 2). Poverty, institutional change and other changes in society (including war and peace) influencing each other provoke strong psychological desires and fears (such as fear of existence, desire to be loved) which result in extreme emotional and material needs (such as the need for shelter, feelings of revenge, the longing for survival and self-esteem – in some cases resulting in a need for power – and strong need for independence – often resulting in the accumulation of wealth). Given the institutional shortcomings due to institutional change, these emotional and material needs – sometimes supported by the sudden opportunities to reap economic profits – result in either taking advantage of institutional weaknesses, ignoring formal and/or informal institutions or in preventing their (re-)establishment. Looked at these causes from a different analytical perspective, they can also be distinguished in political, economic, socio-economic, socio-cultural, demographic, legal, administrative, technical (concerning land management), ecological and psychical causes (see Fig. 3). All of these causes are also included in the model presented in figure 2: Political, economic, socio-economic, socio-cultural, demographic and ecological causes are part of the changing framework. Legal, administrative and technical causes are summarized under the institutional shortcomings. The psychical causes have already been addressed (see 3.2). The institutional change that occurred in Ghana which still has an impact on the current situation started with the colonalization. The import of colonial/European/British institutions that have been introduced by the British and later be kept after independence by the now independent Republic of Ghana resulted in legal pluralism that still characterizes today’s situation. The slow transformation from one system to another has never destroyed the entire institutional framework – although many formal as well as informal institutions are ignored. While being weak, the institutional setting functions to a certain degree. An analysis of the land market insitutions in Accra showed that the weakest point is the implementation. The questions now is why are the formal institutions not implemented sufficiently. Apart from limited financial means and human capacities, lack of coordination and cooperation etc. a main problem is the lack of acceptance of formal institutions. This might partly be due to long procedures and high (official as well as inofficial) costs but it also reflects people’s general perception of and attitude towards the state. What’s the reason for it? The negligence of autochthonous institutions and the attempt to replace them by external models (European institutions) have in certain cases resulted in non-acceptance and viola¬tions of government regulations by traditional authorities. Multiple sales of land by different traditional chiefs (head of stools, head of families) and the violation of land use regulations by individuals represent the most common forms of land conflicts. In spite of all the existing laws and the many institutions dealing with land management and land administration, there have been more than 60.000 land cases in Accra at the beginning of the new millenium, keeping the courts busy (Daily Graphic, 15.11.2001). The most common land conflicts apart form boundary conflicts are multiple sales of land. These are conflicts where several people – most often traditional authorities – claim being the owner and sell the land to different innocent clients. Although these activities are facilitated by the weaknesses of the land administration, the question remains why some people exploit them while others don’t. The most previous institutional change in South Africa was the transition from apartheid to the post-apartheid system. The change in law, giving – among others – freedom of movement to everybody resulted in massive migrations of Black people from homelands and townships towards the (big) cities in search of work. In Johannesburg, many of these people looking for housing became “victims” of the land mafia – or with other words had been provided with land by the land mafia. The new-comers often stayed in shacks they built in the backyard of friends or relatives living in a township close to the city. Many of them became organized by local, informal community leaders and often got into contact with the land mafia. A team of land mafioso identified a group of landless, already organized people and charge them R 50 (about US$ 10) each to sign up on a list. Once they had brought together about 2000 signatures (which corresponds to R 100.000 / US$ 20.000), they choosed a suitable site to occupy. This was planned very precisely and often carried out with professional assistance. They completed deeds searches on the land to determine who owns it and used skilled planners to structure a settlement on paper. They avoided occupying private land because they know that the government will treat them softer than private owners. Once the squatters are settled, they had to pay a monthly R 50 (US$ 10) rent and an additional R 20 (US$ 4) „protection fee“ to the land mafia. They also paid another R 10 (US$ 2,50) legal fee every month. The legal fee was paid into a fund so that a legal representative could have been called in if action would have been taken against the squatters (Reeves 1998; Wehrmann 1998). Actors in this land conflict are the poor searching for land and the people acting as land mafia. While the poor’s motivation is mainly the need for shelter (material need), the land mafia is motivated by the search for wealth (material and emotional need). The people acting as land mafia are mainly state officials or well educated, highly qualified people who work within the administration dealing with land issues or who have close relations to state officials. They get the information from within the system and exploit it for their private benefit – thereby exploiting the state and taking advantage of institutional shortcomings – mainly concerning the control of land development and the use of sanctions. The example of the land mafia shows that land conflicts do also occur even when a land registration/deeds cadastre is in place and when there are just little or no institutional shortcomings. This underlines the importance of psychic motivation, material and emotional needs as deeper causes of land conflicts and highlights the need to address them if land conflicts shall be limited. 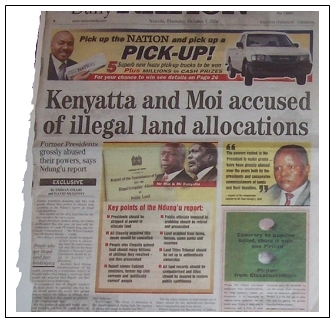 Misuse of power, motivated by psychic desires and the resulting emotional and financial needs, are also the mayor cause of the big land conflicts in Kenya which consist in land grabbing and illegal land allocations by influential people. The Ndung’u report from 2004 revealed that the former presidents Kenyatta and Moi as well as cabinet ministers, former high ranking civil servants and other influential people illegally acquired title deeds. They grabbed land from farmers as well as forest areas, game parks and reserves – mainly with the support of public officials. The report asked for the prosecution of those people who illegally gained land and those public officials being involved in land grabbing. The report also demanded to set up a Land Titles Tribunal to clarify ownership. As a final objective all illegally acquired title deeds should be cancelled. This third example shows once more that the individual motivation of people and their chances to manipulate the system are crucial factors in land conflicts. The motivation can, however, be very different: a poor landless person’s psychic desires and material needs resulting in the illegal occupation of a small spot is definitely different from a president’s psychic desires when he sells out state land or registers huge areas on his own name. The crucial issue is to identify the emotional and material needs and the psychic desires behind to find alternative solutions. A person’s desire for power, influence and maybe even wealth might be satisfied in a different way (e.g. by attributing additional status through other means) which allows transferring at least part of the state and private property back to the original owners. Among the many different ways to classify land conflicts (Wehrmann 2005) the one based on the social dimension of conflicts is the most suitable of all – especially when it comes to conflict resolution. One possibility of classification conflict research offers in this regard is the distinction according to the social level where a conflict takes place: inner-personal, interpersonal, inner-societal and inter-societal/international level. While in the case of land conflicts the inner-personal level can be ignored, the other three levels are very useful for a classification. 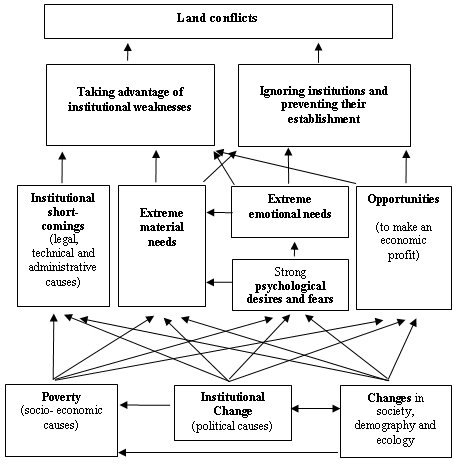 Land conflicts within one country will then occur at either the interpersonal or inner-societal level (see Fig. 5). Another, however quite similar way of conflict classification is based on the social dimension of the conflict, distinguishing between micro-societal, meso-societal and macro-societal dimension. While the micro-societal dimension is equivalent to the interpersonal level, the other two allow a more precise classification of inner-societal conflicts (see Fig. 4). 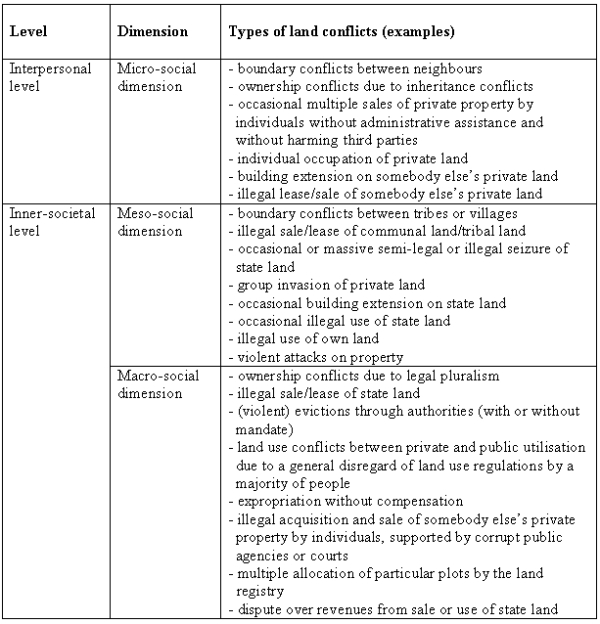 The classification of land conflicts according to their social dimension illustrates the high number and diversity of inner-societal land conflicts compared to inter-personal land conflicts (which, however, does not tell anything about their absolute number). While in most cases interpersonal land conflicts can be addressed by existing formal or informal conflict resolution bodies (see Wehrmann 2005), inner-societal conflicts are much more difficult to tackle – mainly because conflict resolution mechanisms at the higher level are part of the problem. In the long term, land conflicts can only be resolved and avoided if addressed with an integral and system-oriented approach. Core elements of conflict resolution and prevention are therefore the establishment of a state under the rule of law and the implementation of good governance to minimise the abuse of power and corruption. Beyond that, an active trauma counselling and a reappraisal of historic injustice by integrating psychotherapeutic methods are required to restore missing trust in the state and its institutions. Further elements of conflict resolution are functioning regulative and constitutive institutions of land markets, which have been locally adapted, a transparent capital market and a coordinated system of arbitration boards and jurisdiction. Good governance is of particular importance in this context. Its criteria such as sustainability, subsidiarity, equality, efficiency, transparency, accountability, public participation and security – if applied to land tenure and urban land management – form a good basis for development of cities in developing countries to be relatively free of land conflicts (see WEHRMANN ET AL. 2002; MAGEL/WEHRMANN 2001). the establishment and control of an accessible and transparent capital market. Conflict resolution, including moderation, mediation and arbitration. Conflict resolution can take place at different levels; it can be applied within the formal as well as within the informal sector or even in mixed forms, so called hybrid structures. Conflict resettlement institutions can also be based within the administration – be it the state or the traditional administration. Land management, including different ways to clarify land rights and secure tenure, surveying and land registration, land consolidation, land readjustment, land sharing, land pooling, land use planning, investments into the housing market (including housing for the middle class, social housing, social concessions, site and service programs and site without service programs), recovery of state assets and an increase of transparency and documentation of land conflicts (e.g. through state land inventories, special GIS which document land conflicts). Psychotherapeutical approaches. Land conflicts as any other type of conflict often end up in vicious circles when the conflict parties stick to their positions and unconsciously force each other to represent increasingly extreme positions. People normally tend to project negative characteristics on each other until the opposite party finally incorporates them. Reality becomes more and more disguised and the other conflict party ends up being responsible for all negative aspects in life, e.g. squatters often make the state responsible for all their problems while the state considers them as a handicap to any development. In such situations it becomes necessary that both conflicting parties change their perception of the other to pave for an equitable dialog. This can be achieved by a sociodrama (a kind of psycho-analytical/therapeutical role play). As generally it cannot be expected that both parties will do it together, they can at least do it among themselves, thereby experiencing the feelings of the other party and developing empathy for their position, behaviour, interests and needs. As an alternative, street theatre and TV soap operas can be used to deal with typical land conflicts people are typically involved in. Land conflicts can only be minimized if all approaches are combined as required by the specific land conflict and adopted to the specific situation, respecting existing rules, organisational structures and the overall cultural, political, legal, economic and social frame conditions. Institutional changes are conflict prone and therefore tend to be phases of increased land conflicts. While some forms of land conflicts can occur under different and even stabile institutional frame conditions (such as border or inheritance conflicts), others depend on the kind of institutional change. Multiple sales due to legal pluralism for instance are typical for slow institutional changes that lead to the overlapping of two systems, while illegal sales of state land are quite common in situations of either abrupt institutional change that are marked by a temporary absence of rules (transformation) or longer term absence of a functioning legitimated institutional frame (civil war, dictatorship). The dimension of (the physical and psychological) violence that occurs, however, always depends strongly on the conflict asymmetry, which despite of all the differences of land conflicts leads to similar patterns of inter-personal relations – a fact that underlines the importance of the inherent psychosocial dynamic. The case studies illustrate that institutional change as well as other elements of change and a low level of development can result in massive deficits in the institutional framework of land markets. These functional weaknesses can enable land conflicts. Land conflicts are however rather caused by the egoistic exploitation and intentional continuation of institutional gaps and by the disregard of formal institutions than by an absence of rules or an overlap of regulations. Reasons for this are of psychical nature: The fact that the state widely ignores legitimate informal institutions triggers off an act of defiance by the population. In turn, governmental institutions and their rules are likewise disregarded. This can lead to massive violations of land use regulations and consequently to land use conflicts. The material desire for wealth and the emotional desire for status – especially pronounced in African societies – additionally contribute to the violation of regulations. In civil-war and post-conflict countries, the exploitation and continuation of institutional weaknesses is particularly common, which again can be understood when considering the psychological factor. Civil war evokes and intensifies extreme psychical fears (fear of loss and of existence) and desires (revenge, power), which create particularly pronounced material needs for ensuring one’s livelihood and wealth as well as emotional needs for respect and thus (moments of) power. This means that almost all sections and social strata of the population are involved in land conflicts, which are more diverse, more frequent and more often result in violence than in a situation of legal pluralism. Thus, the primary reasons for land conflicts are peoples’ psychical desires and fears as well as their emotional and material needs. The pursuit of resulting individual interests is considerably facilitated by the lack of an institutional framework. As a general rule, it can be assumed that a weakness of those institutions constituting the land market enables the outbreak of land ownership conflicts, while insufficient regulative institutions result in land ownership and land use conflicts alike. The complexity of causes leading to land conflicts as well as their diversity and the huge number of different actors involved requires an integral, system-oriented approach. Besides functioning constitutive and regulative institutions and their adaptation to local requirements, a transparent capital market and a coordinated system of arbitration boards and legislation, the core elements of conflict resolution and prevention are the establishment of rule-of-law principles, the implementation of good governance to reduce abuses of authority and corruption as well as the integration of psycho-therapeutical methods to re-establish mutual trust and respect among conflict parties. In this context, good governance is of particular importance. To transfer its criteria (sustainability, subsidiarity, equality, efficiency, transparency, accountability, public participation and security) on land policy and land management would provide a good basis for sustainable and low-conflict development in African countries. The due establishment of this positive framework is of crucial importance, especially in situations of crisis such as in post-conflict-countries. An established, legitimated and widely accepted framework is necessary to avoid abuse and thus further land conflicts before technical approaches like land registration can be implemented. Only then, the following is true: „No matter how difficult concerted action might seem in the chaos and confusion following conflict, land questions have to be dealt with as early as possible” (Du Plessis 2003, p. 8). It goes without saying that each land conflict needs its individual solutions which are adapted to its local, regional, national and supranational political, socioeconomic, cultural and power-related frame conditions. It depends on each specific case which of the tools and approaches presented can or must be applied for effective solutions on land conflicts. Du Plessis, J. (2003): Land plays a key role in post-conflict reconstruction. In: Habitat Debate, Vol. 9/4, p. 8. Magel, H. and Wehrmann, B. (2001): Applying Good Governance to Urban Land Management – Why and How? In: Zeitschrift für Vermessungswesen (ZfV) Vol. 126, pp. 310 – 316. Reeves, J. (1998): The move form slums to suburbs. In: Saturday Star, 21.2.1998. Wehrmann, B. (2005): Landkonflikte im urbanen und peri-urbanen Raum von Großstädten in Entwicklungsländern – mit Beispielen aus Accra und Phnom Penh. Urban and Peri-urban Land Conflicts in Developing Countries. Berlin 2005. Wehrmann, B. (1998): Urban Informal Land Markets with a special focus on South Africa. In: International Workshop on Comparative Policy Perspectives on Urban Land Market Reform in Latin America, Southern Africa and Eastern Europe. Workshop-documentation. Cambridge, Massachusetts, USA, 7 – 9.7.1998. Wehrmann, B. et al. (2002): Good Urban Land Management. In: Trialog 74, 3/2002, pp. 13 – 19. The author is geographer and social anthropologist with many years work experience in development cooperation and academic education. She has been working in Europe, Africa, Asia and Latin America in the fields of urban and rural development, governance and decentralisation as well as land management and land policy. She did her PhD on land conflicts in developing countries. From 1995 – 2000 she worked as junior expert for the German Development Cooperation (GTZ). Since 2000 she is program manager at Technische Universität München where she set up an international master’s program on land management and land tenure. She is also conducting research projects abroad and doing consultancy for different international organisations. She has published more than a dozen articles on land and development issues in developing countries.